A dining chair with a sleek, polished appearance, the Midtown Dining Chair from Zuo Modern is sure to become a mainstay in your contemporary dining room. From its slender shapes to its clean lines, this dining chair delivers a distinct impression day after day. In addition, the dining chair boasts stunning polyblend fabric and includes a cushioned seat and back that provide exceptional comfort. Choose a first-rate dining chair that is constructed to last � the Midtown Dining Chair. Contemporary design includes slender shapes and clean lines, giving the chair a distinct look and feel. Includes a textured polyblend fabric that will look great day after day. Cushioned seat and back make it simple to sit comfortably. 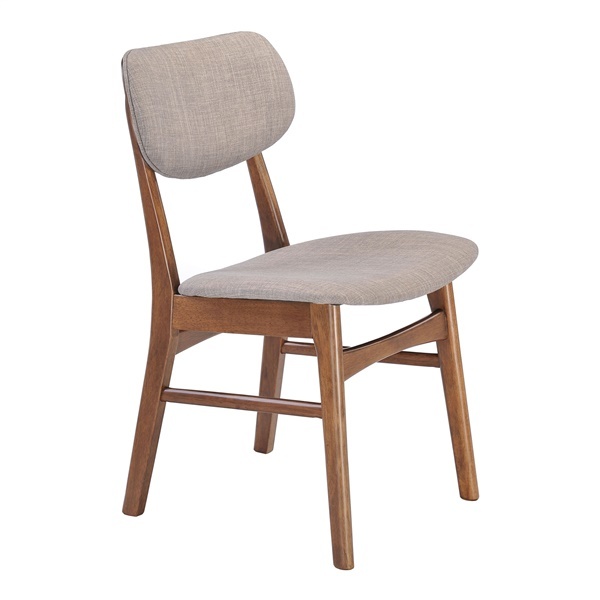 Rubberwood finish further enhances the chair's overall appearance. What seat colors does this chair come in? This chair only comes as shown which is considered a dove grey textured polyblend fabric. Here is a nice alternative chair in a different color - http://www.inmod.com/sunpan-clive-dining-chair.html .